"Indian Union to Hold Queen's Park March"
"About 100 Indians are expected to join a march on Queen's Park today to demand a new Indian Development agency that would be entirely outside the provincial government." "Ottawa Rally Planned After 'Heartbreak and Shock' of Murder Charges in Case of Missing Halifax Woman"
Jarrett, Chase, Turtle Island News, 5 Mar 2014, p.16 "Heartbreak and shock are setting in for a Nova Scotia town and family as murder charges confirm that the nightmarish story of a missing woman is indeed a reality." "Mohawks Block Roadway Draw Attention to Issue of Missing and Murdered Aboriginal Women, Fundraiser Being Held"
Duric, Donna, Turtle Island News, 5 Mar 2014, p.15 "A Six Nations musician is spearheading a charity concert tomorrow to raise funds and demonstrate support for an on-going blockade near the Tyendinaga Mohawk territory that aims to call attention to missing and murdered aboriginal women." "Failure to Consult and Safety Concerns Shuts Down Enbridge Line 9"
Duric, Donna, Turtle Island News, 26 Jun 2013, p.2 "Protesters remained on site throughout the day yesterday despite an injunction ordering them to stop the blockade of Enbridge's Westover pumping station Tuesday morning." "No Comment at Ottawa on Indian 'Land Offer'"
"The Six Nations confederacy of chiefs claims a hereditary right to govern the Six Nations reservation near Brantford. 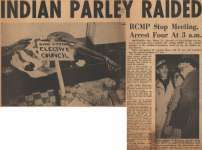 On Monday the rebellious chiefs passed a resolution offering to sell about 2,000 acres of Southern Ontario to any foreign power. The offer excluded Canada and the United States."